Get My #1 Rated Motion Sensor Sprinkler! I originally picked the Contech Scarecrow as my #1 recommendation for getting critters out of your yard, but that model seems to be unavailable, or extremely expensive where available. After doing some research and reading some reviews, I now recommend the Orbit 62100 Yard Enforcer as your best option for motion activated sprinkler. According to reviews on Amazon, it’s made of a much higher quality construction material. I can confirm this at least in part, because from the video below, you can see that the hose connection port has a brass lining, meaning you will get a more solid, long lasting connection to your garden hose. Two of the most common complaints about this type of product is that it leaks, and that leaving the hose connected (while on) for an extended period of time can actually strip the threads. Sounds like this won’t be a problem for the Yard Enforcer. 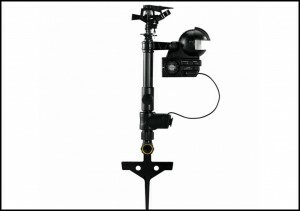 The Orbit Yard Enforcer uses 4x AA batteries, and can get over 7500 activation cycles. This means even if your sprinkler goes off 10 times every day, you can still get over 2 years of use from one set of batteries! Obviously, the amount of time you get from the battery pack will depend on how often it activates. Are there stores in the 95834 area where I can purchase the Orbit Yard Enforcer motion activated sprinkler? If not please advise re a purchase via the internet. Are these available in the St.Louis, MO area? 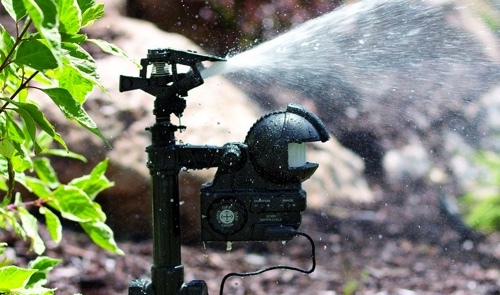 Where can I purchase an Orbit motion sensor sprinkler? Also, how much are they? I live in the SW suburbs of Chicago.